Women and painful shoes – why do we torture ourselves? I started thinking about painful shoes when the story broke this week about the temporary receptionist, Nicola Thorp who was sent home because she wasn’t wearing high heels – this being somehow pivotal to the City’s ‘smart’ dress code. As I write this a UK Government petition to make it illegal for a company to require women to wear heels stands at 134,000 signatures, including mine. Of course this is plain wrong – a bit of everyday sexism left-over from what I hoped was a bygone age – but it got me thinking. High heels have a reputation for the suffering they inflict and have spawned a whole industry of cushions, pads and insoles designed to make foot pain more bearable. But it’s not just stilettos that cause problems; pumps, flip-flops and deck shoes have no support for the arches and pointed shoes crush toes together. Just about any shoes we want to wear should carry a government health warning for our feet. Why do we choose to suffer for fashion? I am embarrassed to admit that I’ve developed a permanent bony lump on the back of my heels called Haglund’s deformity (less hideously known as ‘pump bump’). This is the result of wearing hard-backed shoes that rub the heel and in my case made worse by the purchase of a pair of gorgeous patent leather Grenson brogues that refused to ‘give’. I can wear them occasionally now, after the manufacturer kindly stretched the heel a bit, but the damage is already done. When I look back at my 50-year-old relationship with footwear it is a sorry tale of blisters, sores, callouses, bruised toe-nails covered up with nail polish, hot painful soles and cracked heels. My Grenson ‘Lucy’ shoes had to go back to the factory for stretching. I’ve always loved my feet. They’re quite small, size 3–4 depending on the shoe, and until recently I’ve had very few problems. Or at least that is what I told myself but when I think about it I find that I’ve not been quite truthful with myself. There are far too many bloodied elastoplasts littering my memories. I’ve never been a fan of heels, but of course I’ve had my fair share. 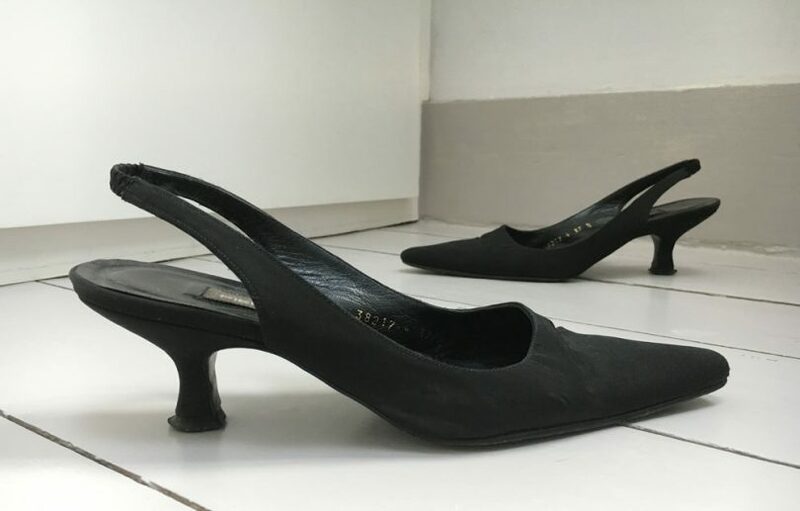 The picture above this post shows a pair of pointed black kitten heels that I cannot throw out because the shape is amazing. I cannot wear them though – after twenty minutes they squeeze my toes tight and the ball of my foot throbs – even though the heel is just one and half inches. I thought I was missing a trick – that it was just me who found heels excruciatingly painful after a few hours. That feeling of pressure building as the fleshy ball of the foot starts to hurt and you shift the weight off first one foot, then the other, for brief periods of relief without anyone noticing. The veil on this myth was finally lifted when my partner bought himself a pair of 2-inch cowboy boots and we stood in the pit for a production of Merchant of Venice at The Globe. At the interval he complained that the balls of his feet were burning like hell and I realised it wasn’t just me. High heels do make long, slender limbs look beautiful and they do give height and elegance to those who can wear them with grace. On the other hand they can emphasise a broad beam, thicken a muscular calf and turn an ordinary gait into a teetering, crippling shuffle. Fortunately I live on the edge of hipster East London where heels are definitely NOT in fashion but when my brogues pinch I suspect it’s still reflected in my stride. Small, delicate frames seem better able to carry off heels – Prince and Carrie Bradshaw come to mind. The truth is that most of us are absolute suckers for foot fashion. We seem to be prepared to put up with any amount of physical torture during the period of ‘wearing in’ a pair of shoes or boots, confident in the belief that this will eventually give way to comfort. And so it does – sometimes. Mostly the shoes which cause us pain continue to do so until they’re finally bagged up for the charity shop and sent off to torture someone else. But we keep on buying pair after pair with a special kind of female amnesia that is a marketing department’s dream. Men suffer from painful shoes too, especially when it comes to heavy brogues, but they tend to keep their shoes longer and eventually wear them in. Once shoes ‘fit like a glove’ you’d have to be mad to wear anything else. I won’t give up on my love for shoes but I’m going to be more discerning. I have to think of my poor ‘old’ feet which will widen and flatten with age, the fat padding on my soles will wear down and the skin will become dryer. I promise myself I will search out beautiful AND comfortable shoes. I will walk in them for more than a few steps in the shop before I buy. I will try to be more realistic so that I can wear beautiful, stylish, almost flat shoes forever.